Recently, while commenting on an entrant's card I found this stamp company and fell in love with the line of stamps they offer. The faces on these stamps are beautiful. Go over to their site and check them out here. This stamp is called "A Mae Day". Adorable card! This is so cute! Thanks so much for joining us on Some Odd Girl! P.S I LOVE your blog background!!! Cute card, love the ribbon border. Thanks so much for joining in with the Cardmadfairy Easter challenge. Wonderful image you have used and terrific papers. Thanks for joining us at Cardmadfairy Digi Days. So cute! 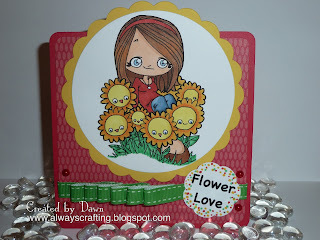 Love the design of your card and the colors! Thanks for being Odd with us! Thanks for sharing with us at Creative Craft World for our Easter Challenge. How cheery! I love the colors you have used and the image is adorable. Thanks so much for joining us at FFF, we look forward to seeing your future creations. Really cute! I love the card design and ruffled ribbon. Cute card Dawn, thanks for joining our challenge on Some Odd Girl. Oh that's cute! Thank you for taking up our challenge at Creative Craft World.